So little is said compared to the length of time spent thinking. We can spend days without saying a word. We gaze at the horizon, glance through a photo album, ramble in deep inner monologue. The diaryof this patient grinding of images and sensations, memories and fantasies uses an evanescent language; one that seems practically intranslatable. We refer to this language when we give words to the thoughts of a soldier in the front line who has been left alone to guard on the flag and a prisoner. The soldier is woman and clown. She is guardian and prisoner of a tale she is spinning as she is looking into the eyes of a privileged spectator. 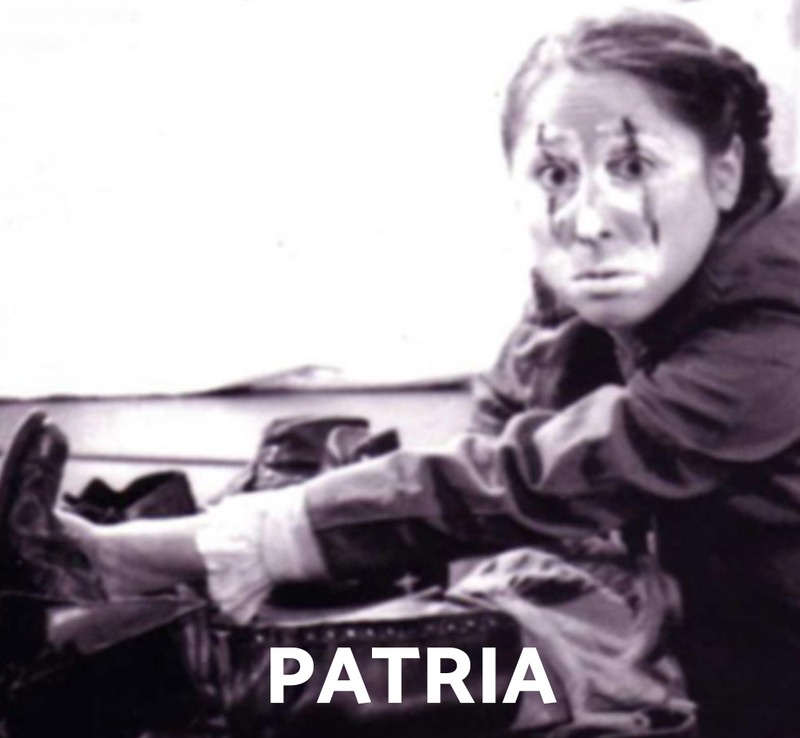 “PATRIA” (homeland) follows an outline that was set by previous plays, all of which were conceived as plays for “a single spectator”. It is a theatrical form I am enquiring into and which I want to affirm, for it allows us to caress our audience. Caught between the firing of howitzers and the increasingly leaden sky, the soldier and her prisoner exchange thoughts, scraps of memories. Around them lies a devastated battle field covered with the dead, almost alive, and the living, who are near death. Besides struggling against fate and exhaustion, the clown fights against the besieging objects surrounding her. Some of the material at our disposal were some recordings of Maria’s childhood. They are the sounds of her memories: her sister’s voice, footsteps on the staircase of her grandparents’home, the choir in which her brother used to sing, the ambience caught by a microphone left on on Easter day. These are the sounds that tell us of the homeland we carry within ourselves, a homeland that transgresses borders and ignores flags, a homeland that awakens in us the yearning for home, for a return, for roots. This is a project that I have built together with Maria and Dolores. In it we tell of the madness of war and of the innocent wish to return somewhere, once the last sniper has stopped shooting.